We are thrilled to announce the completion of a series of independent oxygen transfer tests on our ECT-70 fine bubble tube diffuser product. 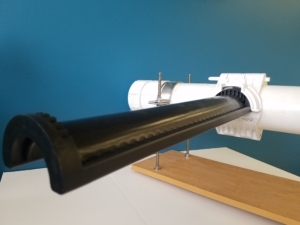 We already knew that this was an attractive, cost-effective alternative to tube diffusers on the market, with the integration of SSI’s patent-pending single molding technology and high quality EPDM, PTFE and Silicone membranes. However, now we can also claim that we have one of the most efficient tube diffusers on the market. Please have a look at the ECT-70 SOTE test report here. SSI diffusers have never failed an oxygen transfer test. How do we do that? We test our diffusers independently at a variety of diffuser densities and water depths. We use proven models to correct for depth and density to actual project values. Our quality control system is certified by TüV Rhineland to ISO-9001:2015.